At an Apple ShowCase Event in Chicago yesterday I had the pleasure of listening to the advice of many talented educators who have successfully launched and implemented 1-1 Mac learning environments. As I listened to their stories I found myself writing down many quotes for use as I begin this journey. Upon reflection, I realize that I can do the most with the quote from Shannon Soger, 1-1 coordinator and instructional coach from D100, Chicagoland. The quote is in reference to the SAMR model of tech integration and I have been very happy about Apple’s consistent use of this model as a framework for 1-1 implementation. 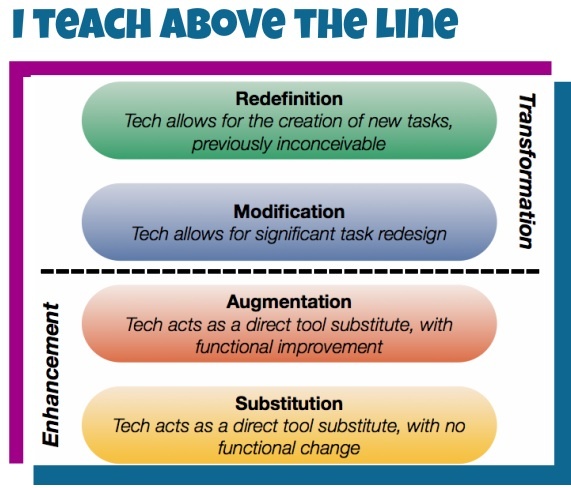 I have already introduced the staff at my school to SAMR and intend to continue to return to it whenever I am teaching teachers or working in their classrooms because it’s simple, easy to measure and something to strive for. Shannon told us she made t-shirts for staff with the slogan. I probably won’t be able to make t-shirts or buttons, but I made this graphic to display nicely on our new iPads. Maybe I will try to make a digital badge with it too.